Gnocchi with Pumpkin and Basil - Very aromatic and simply delicious! 1 For the gnocchi, rinse the potatoes. Cook in boiling salted water for about 30 minutes. Drain, and let dry. Peel and pass through a ricer. Mix with the egg and flour, then season with salt and freshly grated nutmeg. Knead until a smooth dough forms. 2 On a floured surface, roll the dough into finger-thick rolls. Cut into pieces about 1.5 cm (approximately 1/2 inch) wide. Indent with the tines of a fork, then cover with a kitchen towel and rest for 10 minutes. 3 Cut the pumpkin into 1 cm (approximately 1/2 inch) cubes. Heat the oil in a pan, and cook the pumpkin until golden brown. 4 Add the gnocchi to a pot with boiling salted water, and cook for 8-10 minutes over medium heat. The gnocchi are done when they float to the top. 5 Rinse and dry the basil, then remove the leaves. Melt the butter. 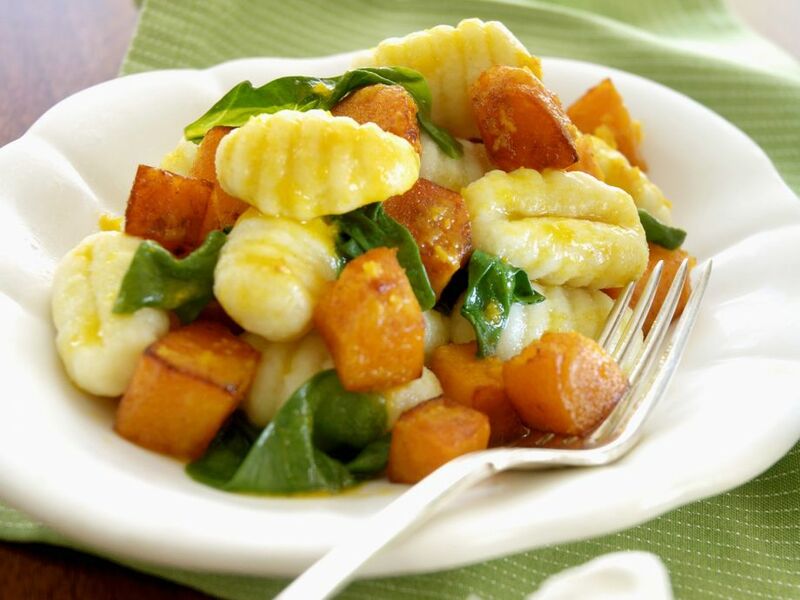 Divide the gnocchi and the pumpkin onto plates, then top with the melted and basil. Season with the salt and nutmeg, then serve.